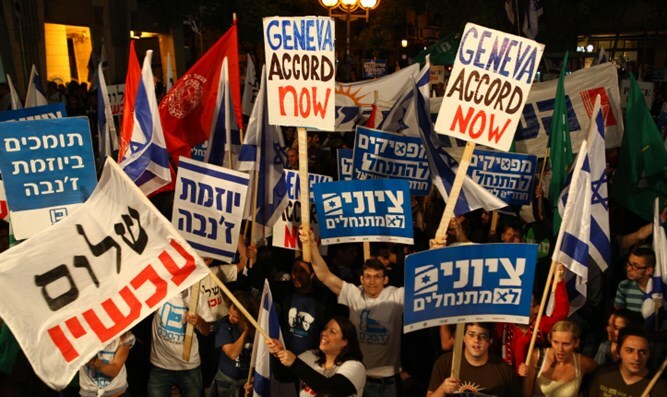 New 'Peace Now' head is gay, leftist, anti-religious; calls settlers "Ashkenazi elite." Avi Buskila, newly appointed CEO of the radical left Peace Now Movement is both Mizrahi (of Sephardic origin) and homosexual, and he intends to make waves. "I'm not going to apologize for the fact that I served more years than Bennett in the IDF. And I'm not going to apologize for living in the periphery longer than Miri Regev. And I'm not going to apologize for my belief that it's our turn to move our camp forward," he said in an interview with Yediot Ahronoth. Buskila has a lot to say about Jewish Home Party ministers. "Uri Ariel is the epitome of evil, in my opinion. He's a Diaspora-type Jew, afraid, running around with a hand grenade in his pocket to save his life. He doesn't see anything besides a Greater Israel, and he's willing to pay for the land with blood," Buskila said. "He's the man who took the Torah into his own hands and translated it as he saw fit, with racism, homophobia, and using a lot of money. He's not alone, he sits in the same party as half-baked Smotrich and sweet-lipped Ayelet Shaked, who says horrific things and doesn't understand that a more Jewish state is a state in which I have no right to exist as a homosexual. She doesn't understand that there needs to be a choice of television stations, that on Shabbat they close off our entire country, that your first grader will have to learn Bible studies," Buskila ranted. "Ask Bennett in my name," Buskila continued. "How many Sephardic people are in the Jewish Home? There are hardly any, because it's all about elitist Ashkenazi and Anglo-Saxon settlers. The nation is supposed to serve them, and it's serving them even now. And within this elite, there are the Hevron settlers, who are the elite of the Ashkenazi elite, and receive more money than any other settlers." Buskila seems to have forgotten that Jewish Home Deputy Defense Minister Rabbi Eli Ben Dahan is of Mizrahi origin, as is MK Shuli Moalem, while Ayelet Shaked is of a mixed Sephardi and Ashkenazi background. In addition, a large percentage of Mizrahi Jews are traditional and go to the Kotel and Hevron on Sukkot - and many make their homes in the "settlements." "They don't see Israeli citizens, not my mother and not their own friends in Kiryat Shmona, they only see themselves. 300 million shekels were given to settlers in the past few months. How much money was given to Kiryat Shmona residents? Does Bibi even see Kiryat Shmona from his airplane? The city is on the verge of collapse. When it was under bombardment they watched over it, but today the city doesn't interest anyone." Buskila has not yet managed to convince his parents of correctness of his "new" path. "I keep trying to convince them. but they don't make exceptions, they're constantly under attack. My parents are Likud supporters, but they're slightly different: they are completely convinced there's no choice but to separate from the Palestinians, or whatever you want to call it. They think there's a problem with the fact that we're an occupying country, and other than that they're in my group of people to be criticized. That's where I'm convinced logical debates will work, I've already tried to convince them once not to vote for Bibi, I managed to convince my mother but not my father," Buskila concluded.